Last Friday afternoon, I got a text message from a very good friend, telling me that I won a pair of advance screening tickets to Land of the Lost! Thank goodness my shift would end early enough for me to do something else before the movie starts. Well, that is, if my work doesn't get too trigger happy with overtime. Even so, I'm confident I'll be there with enough time to spare. Glad to take along another friend with me. While I'm not exactly a Will Ferrell fan, the movie seems interesting enough. It'll be the first time I see Anna Friel on screen post-Pushing Daisies and A Midsummer Night's Dream. One dose of laughter, here I come. During that same Friday, I got shocked in a not-so-good way. It was so bad I think I was either gnashing my teeth or biting my tongue in order to hide my disbelief. Talk about literally being left behind. Even if I felt my new ATM in my pocket, it couldn't reduce that feeling of reckless abandonment. This is coming from the heels of an orientation wherein I was reassured that I will be asked to put out fires without seeing someone else demonstrate it first. Oh well, so much for great expectations. It's now becoming more obvious to me that it's how things are in that group. Oh, the irony of it all. Being greeted by that supposed seal of quality every time I exit the lifts exacerbates the irony further. Last Saturday, my very good friend and I watched District 9. Having watched UP with her a week before that, she asked me to choose from either watching the same movie in 3D format or another movie. While I wanted to stick to our original plan, I was planning on watching The Time Traveler's Wife and District 9. I thought a new movie would be fun. 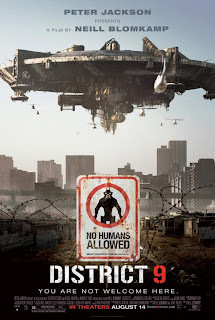 Between the two movies, I was leaning more towards District 9 since I've been hearing a lot of great feedback from the movie critics I follow on Twitter. When I found out that she hasn't watched it too, I think that helped me seal the deal. Besides, I'd prefer watching a movie with a Sci-Fi/Thriller label with someone. For some reason, it helps lessen the chances of me having nightmares about such kind of movies. Two hours after, not only were my fears unfounded, I was completely amazed by the whole movie. Gore notwithstanding, what caught me off-guard was the movie's unique brand of storytelling and direction. I think it helped that the movie featured mostly unknown actors (like Cloverfield) as it allowed moviegoers to zero in on the story. It was fluid, simple yet heartbreaking in spots. The special effects were amazing despite the movie's relatively low budget. The rough-around-the-edges look may suggest such but it only adds more depth to the movie. Neill Blomkamp proved a lot of things, enough for me to say that I'll be looking forward to his future endeavors. No wonder Peter Jackson stands behind him. I won't mind watching the movie again. For now, I'll immerse myself with the movie's virals which would definitely enrich my District 9 experience. The past few months have offered a lot of unexpected twists and turns for me, even more in the last few weeks. It's all part of my life now, I guess. Come this Wednesday, I'll be on my third week with my new job. Same field but different industry. And surprisingly so. I never imagined I'd be able to work for such an organization despite my lack of industry-related experience. But I guess my communication skills won them over. After my three-day honeymoon, I was thrust headlong onto what could be one of the most stressful jobs I've ever had in my life. Not that I hate stress enough to banish it from my existence. Stress is somewhat Work's bitter, evil twin sister. I remembered when I started working. I took it as hard as I could. I wanted to excel at what I'm doing, make a career out of it. Wondering what has changed since then? Oh well, I just had to deal with a little thing called quarter-life crisis plus a good dose of Stephen Covey and I declared war against my own workaholic self. Balance became my goal. It's a constant struggle to this day but I think I'm able to manage it already. Since fans have helped transform the Twilight franchise into Hollywood's shiny new toy, you know what comes next: paparrazi! When principal photography started last March 2009 in Vancouver, Twilighters were getting their fill of all possible gossip and spoiler-filled pictures. Therefore, you can just imagine the fandom explosion when this picture on the left appeared. Was it hot? Scorching! Was it romantic? Kilig factor up! Was it accurate? A big flat NO! Why, you might ask? Every Twilighter knows that the Cullen's eyes turn golden when they've fed, black when they're hungry. 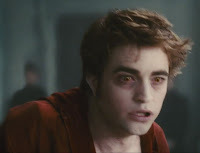 Bella noticed that Edward's eyes were black and had dark circles when they, as well as Alice, were sent to the reception area to wait for further instructions after their freedom has been granted by the Volturi. Bella even suggested to Edward that he should go and eat despite her own feelings of not wanting him out of her sight/reach. Apparently, this bit got lost in adapation. The picture on the left is a screenshot of the latest promotional installment for the movie: the Meet Jacob Back featurette that was shown before Bandslam in the U.S., which is another Summit Entertainment production. Now, if you'll look closely, Edward's eyes are golden! Does that mean he was able to feed himself before he was tortured by Jane? Canon-wise, I don't think so. I could cite a few more reasons that scare me about New Moon's adapation, such as Chris Weitz's vision of the Volturi or the insertion of about two or three scenes that weren't in the book. The latter makes me weary. More weary than Chris Weitz's version of the Volturi. Still, it doesn't lessen the frustration that I feel. Since New Moon will be released in a few months from now, all I can do is to start lowering my expectations. I sincerely hope that I won't nit-pick the movie when it hits the cinemas. A wife who bared the injustice and the death of her husband. A leader of the famed bloodless revolution. A president who governed over a time of transition. A mother, not only to her children, but to all. A loyal servant of God. A woman of grace and substance. A Filipina like no other. You braved a great yet arduous fight. You lived a life worth emulating. May you rest in peace. 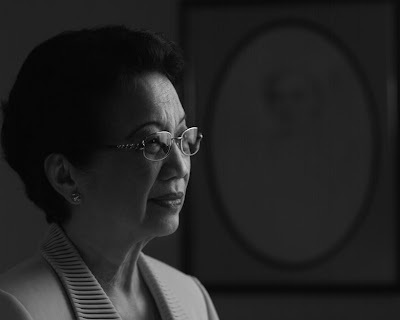 Our prayers are with you and your family. You will be missed.